A member of the cucumber family, a zucchini thrives on well-drained soils and plenty of sun. It is also considered a highly productive summer squash. Apart from a zucchini's nutritional value, they make great summer recipes, whether you prefer adding them to pancakes or making your own zucchini baked bread. 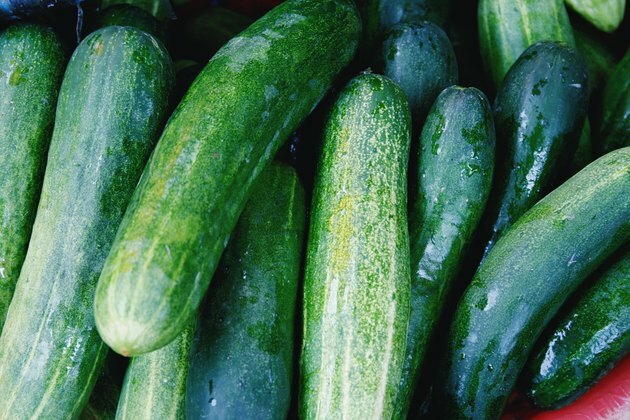 When planting or harvesting zucchini, it's critical to know how to grow your best crop without exposing the plant to diseases or having them wilt in the sun. Generally considered easy to grow, zucchinis need well-drained fertile soils along with plenty of sunlight to grow in generous quantities. For best results, make sure you amend the soil with a layer of compost to improve moisture retention. As strong winds can affect the plant's growth, it's advised to provide them with a safe location or shelter them with a row cover. Start your planting about a week after the last frost and plant two to three seeds 36 inches apart for individual growth. It's beneficial to plant seeds in peat pots, greenhouses or hotbeds, then plant out in the garden approximately three weeks later when frost is no longer an issue. Make sure that your zucchini plants are 3 to 4 feet apart in rows 8 to 12 feet apart, so that they have enough space to spread out and begin to grow. Ideally, you will need a nearby source of water to make sure the plants have easier access to moisture. Regular watering will keep your zucchini squash from wilting in the sun and maintain the soil around the plant as moist as possible. Give your zucchinis at least 2 inches of water per week and compensate with manual watering if rainfall is not sufficient. Make sure you water the plants from below their leaves and spray them with compost tea two weeks after the seedlings appear. You can repeat the process after another three weeks or when you start to notice the first flowers. Use a soaker hose instead of a sprinkler to avoid earlier diseases such as powdery mildew. By mulching the soil around the plants, you can help maintain the ground temperature stable and prevent water evaporation. For this, you can use low-nitrogen commercial fertilizer or your regular compost. Pruning your zucchini will also allow more sunlight to reach the fruits as zucchini leaves can grow larger and reduce exposure to the sun. What Is the Difference Between Collards & Turnip Greens?